The concept of fast, cheap, integrated housing is fleeting unless it is strictly regulated, flexible and profitable to do so. Due to low cost construction, sub-standard design and low maintenance, housing in this range often results in overcrowded, unsightly and unhygienic conditions. Inevitably, neighboring real estate values fall, squatter or slums might develop and incidences of petty crime might increase. HONG KONG - Space-starved Hong Kongers could see a steep ramp-up in the number of new flats built - to the tune of 50,000 a year, if a key aide to new leader Leung Chun Ying has his way. If realised, it will be the highest number seen in Hong Kong over the past two decades, and will certainly bring to a screeching halt the spike in property prices, which have soared 80 per cent in the last three years alone. It marks a huge jump from the 18,000 flats that were built in the last fiscal year ending March, and outstrips the 35,000 goal set by the previous Donald Tsang government for the coming years. In an interview with The Straits Times, Mr Barry Cheung, who chaired Mr Leung's election campaign and is now a member of his executive council, said: 'I think we have to provide significantly more flats than what we did in the last five years. Mr Leung has made housing a key platform of his government and has pledged to release more land. But he has not said how many homes they will provide for. Mr Cheung's view - he is also the chairman of Hong Kong's Urban Renewal Authority - provides a hint of the parameters that the new administration is considering. But flooding the market with 50,000 units a year invokes fears of plummeting property prices. In 1997, Hong Kong's first chief executive Tung Chee Hwa promised to build 85,000 flats annually - reportedly Mr Leung's idea. But the policy collapsed when market sentiment went south and Hong Kong was hit by the Asian financial crisis. Mr Cheung says that what is needed this time is for the government to step in with more public housing to buffer private home owners from the impact. Private homes comprise over half - 52 per cent - of the market in Hong Kong. About 30 per cent live in public rental flats, while the remaining 18 per cent live in flats the government sells at discounted prices. Of his proposed pipeline of new homes, less than half - about 20,000 - would be private homes. The rest would be public housing. At the bottom, more rental flats would be built - some 176,000 applicants are now on the waiting list. The government will build 15,000 such flats a year. 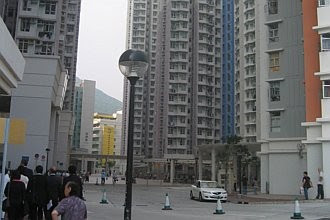 The second tier is the subsidised homes under the Home Ownership Scheme (HOS) for low-income families earning below HK$30,000 (S$5,000) a month. There is a planning target of 5,000 a year. Mr Cheung says that a third tier needs to be created, for what he calls 'the typical middle class' - those who earn too much to qualify for HOS but cannot afford private homes. This way, needs can be met 'without necessarily bringing down the private market'. It will take three or four years to realise this plan of building more flats, but genuine buyers will be able to enter the market before then, he adds. 'If investors see that down the road, there will be increased supply, they will be less inclined to speculate and that takes demand out of the market today. So more end-users would be able to go in,' he notes. Such a proposal would benefit the many Hong Kongers - about 100,000 live in homes such as garrets and bed-space flats - on the hunt for affordable homes. But it raises the ire of developers like Mr Steward Leung, chairman of the Real Estate Developers Association executive committee, who calls it 'irresponsible'. The concept of fast, cheap, integrated housing is fleeting unless it is strictly regulated, flexible and profitable to do so. Due to low cost construction, sub-standard design and low maintenance, housing in this range often results in overcrowded, unsightly and unhygienic conditions. Inevitably, neighboring real estate values fall, squatter or slums might develop and incidences of petty crime might increase. Up-Site Housing is a community of practice designed to address and tackle this issue by both showcasing good models and increasing intellectual rigor in this space. The Iskandar Regional Development formerly known as South Johor economic area is undergoing massive influx of foreign direct investment and domestic economic rejuvenation. 1500 unit of affordable housing built by Iskandar Regional Development Authority (IRDA) caters for families in transition. More social programs and economic benefits can be extended to these families via strong credible implementers.